With all of the intolerable "Acts" of the 1760s, the Wilkes Fund Controversy of the early 1770s, and the increasing hostilities of Royal Governor Josiah Martin, the leading men within North Carolina had finally had enough. In July of 1774, handbills were circulated throughout the Province inviting the people to elect delegates to a convention scheduled to be held in New Bern on August 25th "to represent the Province in a Continental Congress.... with powers obligatory on the future conduct of the inhabitants." "I have heard with the greatest concern, and have read in public newspapers and handbills, of invitations to the people in the several counties and towns of this Province, to meet together to express their sentiments on acts lately passed by the Parliament of Great Britain; and to appoint deputies to attend on their behalf, with powers obligatory on the future conduct of the inhabitants of this Province, at a meeting that I understand is to be held here on the 25th instant. I also find, that meetings of the freeholders and inhabitants have accordingly been already held in some places, at which resolves have been entered into, derogatory to the dignity of his Majesty and his Parliament, and tending to excite clamor and discontent among the King's subjects in this Province." The next day, Governor Martin issued a proclamation, in which he condemned the assemblies and elections of the people, as highly illegal, and warned all officers of the King, both civil and military, to do all to the utmost of their power to prevent such illegal meetings, and more particularly the meeting of certain "deputies" on August 25th. This was to no avail. On Saturday, August 27th, the First Provincial Congress adopted a variety of resolutions on the general state of America and a few only of local interest. They commenced by the most solemn vows of loyalty for the House of Hanover and then in the second Resolve, King George III was formally recognized as the Sovereign of the Province and His Majesty assured of their willingness to support his succession, as by law established, against the open or private attempts of any person or persons whatever. After these submissive resolutions, the Congress proceeded to avow their rights, in a language which seemed to mock the loyalty of the first two, by its violence and inconsistency. They declared that they would not, after January 1, 1775, import from any quarter of the globe any East India Goods or British Manufactures. They declared that, unless American grievances were redressed before October 1, 1775, they would not export any tobacco, pitch, tar, turpentine, or any other articles whatever, to Great Britain. One of the most important resolutions adopted was, that the people of the Province would break off all trade or commerce of any kind, with any city or town, or with any individual in such city or town, that should refuse, decline, or neglect to adopt or carry into execution, such general plan as should be agreed to in the Continental Congress. Also in this First Provincial Congress, the principle of voting by counties and towns was adopted as the most suitable method of deciding all differences which might arise in their deliberations. This turned out to be a great service in preventing long and distracting debates and destroyed the influence of such members as were secretly indisposed to the general cause. The execution of the Resolves of the Congress was entrusted to a County Committee, which the deputies of each county and town were instructed to elect; and here the admirers of an absolute democracy may find a noble and worthy example for their respect and admiration. The rigid scrutiny of these County Committees soon detected all suspicious persons. They extorted oaths of loyalty to the American cause, and the signal punishment which they dealt out to all hapless recusants, made the doubtful sincere and zealous, and the Loyalists (aka Tories) silent and indifferent. Royal Governor Josiah Martin chose to take a "vacation" at the conclusion of this First Provincial Congress, which he was not invited to attend, yet he received daily reports on the deliberations. He went to New York to meet with his predecessor, William Tryon, both quite intrigued as to the similar happenings all over the thirteen colonies. They both met with other Royal Governors and discussed their next moves together. Martin returned to North Carolina in January of 1775 and attempted to retake control of the Province. On February 11, 1775, John Harvey issued a notice for the people to once again elect new representatives for another Provincial Congress - the 2nd - planned to be held on April 3rd. Royal Governor Josiah Martin refused to let this continue - on March 1st, he informed his Executive Council that he considered such proceedings as "highly derogatory to the dignitary of the Legislature, which had been appointed to meet on the same day, and in every light illegal, and inconsistent with good order and government." His Executive Council avised his Excellency to issue a proclamation forbidding such illegal meetings, and he did just that. The Second Provincial Congress met anyway - on April 3-7, 1775 - again in New Bern. Most of the same men then met the next day - on April 4th - as the existing colonial General Assembly, with Royal Governor Josiah Martin. New members of the Second Provincial Congress include: Alexander Martin - Guilford County; Parker Quince - Brunswick (town); Cornelius Harnett - Wilmington; John Hinton, Michael Rogers, and Tignal Jones - Wake County. Both sessions were ludicrous, with virtually nothing done in either. The Second Provincial Congress was in session when Mr. Biggleston, the Governor's Secretary, arrived; and then Mr. Moderator John Harvey, turned himself into Mr. Speaker John Harvey, and proceed to the dispatch of Royal business. On April 8th, the colonial General Assembly was dissolved by Proclamation of Royal Governor Josiah Martin - this was the last colonial General Assembly that ever convened under the Royal government. On April 24th, Alexander Gaston, Richard Cogdell, and other leading Patriots forcibly seized and carried off all of the artillery sitting on the lawn of the Governor's mansion in New Bern. Soon thereafter, Royal Governor Josiah Martin fled New Bern for the security of Fort Johnston at the mouth of the Cape Fear River. He managed to remain onboard the HMS Cruizer, either on the Cape Fear or just offshore, for more than a year - all the while attempting to devise new plans to take back control of the Province. The Province's beloved John Harvey died on May 3rd, 1775 as a result of falling off his horse. On May 19, 1775, the Mecklenburg County Committee of Safety convened and on May 20th drafted a resolution declaring its independence from Great Britain after hearing about the battles of Lexington and Concord in Massachusetts. The Chairman was Abraham Alexander and the Clerk was John McKnitt Alexander. Later to be known as the Mecklenburg Resolves, it was issued by Thomas Polk on May 31st. Samuel Johnston issued a notice on July 10th for the people to once again elect representatives for the Third Provincial Congress - scheduled for August 20th, 1775 to be held in Hillsborough. On August 8th, Royal Governor Josiah Martin issued another of his long tirades disguised as a "Proclamation" - when he penned while aboard the HMS Cruizer. Again, this has little effect on the populace - except to prove that all their actions to date had been justified. On August 14, 1775, many men of Tryon County assembled and drafted "an Association" which later became known as the Tryon Resolves. Click Here for a good description on the 'Net. During the Third Provincial Congress (August 20th - September 10th), it was unanimously resolved that the people of North Carolina would pay their due proportion of the expenses incurred in creating and training the Continental Army. On September 1st, it authorized the creation of two regiments of Provincial Troops with a total of 1,000 men to be stationed across the colony. It was during this Congress that the colony embraced the six existing judicial districts to now also be six "military districts." On motion of Richard Caswell, Samuel Johnston was elected President of the Third Provincial Congress. Andrew Knox was elected Secretary with James Glasgow as Assistant. On September 9th, the Third Provincial Congress authorized the creation of additional Provincial Troops, with a slightly different mission than the first two regiments authorized on September 1st. These additional troops were named Minutemen (or Minute Men), and each new "military district" was authorized to establish one regiment, with Congress providing the commissions of the six regimental officers. The Minutemen were enlisted for six months and were only authorized to serve within the boundaries of North Carolina. On the same date, Congress authorized each of the thirty-five (35) existing counties to raise their Militia, with the stipulation that all men from the ages of 16 to 60 must serve a minimum of three months on a rotation, essentially only once each year. Regiments were created with the field officers of Colonel, Lt. Colonel, Major, and Adjutant, plus a minimum of ten (10) companies to the led by a Captain, two Lieutenants, one Ensign, two Sergeants, two Corporals, a Drummer, a Fifer, and fifty (50) private soldiers. The Militia regiments were to be mustered at least twice each year, and individucal companies were to be mustered and trained at least once each month. The first two regiments of Provincial Troops were assigned to the Continental Line in November of 1775. A Colonel of the Continentals ranked above a Colonel in the Minutemen, and a Colonel of the Minutemen ranked above a Colonel in the Militia. But, a Colonel of the Minutemen ranked above a Lt. Colonel of the Continentals, as did a Colonel of the Militia ranked above a Lt. Colonel of the Minutemen. In the two Continental regiments there were sixty-seven (67) commissioned officers; one hundred and ninety-eight (198) in the Minutemen, and twelve hundred and twenty four (1,224) in the Militia, making an aggregate of fourteen hundred and eighty-nine (1,489) military officers commissioned by the authority of the Provincial Congress at this fairly early stage of the struggle. The Third Provincial Congress appointed a Committee of Safety to prepare a plan for the regulation of the internal peace, order, and safety of the colony. To this committee was also entrusted the duty of proposing a system of government, the definition of powers, the qualification of all electors, "and every other civil power necessary to be formed in order to relieve the Province in the present unhappy state, to which the administration has reduced it." Cornelius Harnett was elected as President of the first Provincial Council, a most arduous and dangerous post to which a citizen could be called, and essentially represented the executive officer of the government, being exposed to all the abuse and insolence of the proclamations of the offshore Royal Governor Josiah Martin. On August 29th, as the Chairman of the Ways and Means committee, Richard Caswell, submitted a report on the state of the public funds, embracing two points, which will serve to exhibit the resources which were inherited from the Royal government. The first was that there was a large amount of public money in the hands of sundry sheriffs, which had been collected under the late government, and the payment of which he recommended should be immediately enforced. The second point was that considerable sums had been collected by the officers of the late government, which he recommended should be returned to the persons from who they were collected or else allowed in any subsequent payment of taxes. 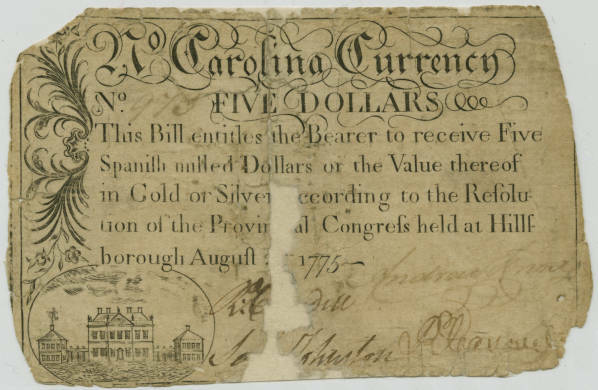 "This bill entitles the bearer to receive five Spanish milled dollars, or the value therefof in gold and silver, according to the resolution of the Provincial Congress, held at Hillsborough, August 21st, 1775." These bills were adorned in the margin with a Masonic emblem and signed by Richard Caswell, Samuel Johnston, Andrew Knox, and Richard Cogdell, who were authorized to superintend the stamping of the plate and to sign them and deliver them over to the two Treasurers of the State. For redemption of these bills, a poll tax of two shillings was laid to commence from the year 1777 and to continue nine years; and whosoever refused to receive these public bills of credit, thus secured, was denounced by a resolution of the Provincial Congress as an enemy to his country. On September 8th, Samuel Johnston was elected Treasurer for the Northern District, and Richard Caswell for the Southern District; and these two men entered into $50,000 bond each for the faithful performance of their duties. On the election of Mr. Caswell as Treasurer, he resigned his seat in the Continental Congress and was succeeded by John Penn, one of the members from Granville County. Although it had been elected earlier, the first Provincial Council did not meet until October 18th at the Court House in Johnston County. As mentioned above, Cornelius Harnett was elected as President, and James Green, Jr. was elected Clerk. The principal business before them was entirely of a warlike nature. The ever vigilant County Committees seem to have aroused the entire population of the colony and to have infused into the minds of the young the desire of war. The journal of this First Provincial Council, much unlike that of the earlier Royal Council, presents a series of peititions and demands not for land warrants or pecuniary claims, but for ammunition, fire-arms, swords, and other warlike implements. Appointments of Paymasters and appropriations for military service had become more the fashion of the day than the appointment of trustees for land surveys. On October 22, 1775, the newly-formed Provincial Council received news of serious discontent among the people of New Hanover County, and this calamity was charitably ascribed to the misrepresentations of the offshore Royal Governor's party. The people had assembled in a large body and publicly protested against the proceedings of the late Congresss as beyond the limit of a peaceable mode of redress, and as of a character decidedly revolutionary, or rebellious. The Provincial Council highly disapproved of such conduct as tending to create dissensions to the prejudice of American liberty and they instructed John Ashe, Samuel Ashe, and President Cornelius Harnett to explain the proceedings of the Provincial Congress to the people, and to endeavor by argument and pursuasion of the rights of the Province. These emissaries soon restored order and infused zeal wherever they went; and the discontented people of New Hanover County soon yielded to the influence of their three leaders and returned to the support of the common cause. The Second Provincial Council was convened, again at the Johnston County Court House, on December 18, 1775. On the second day of its session, the Sheriff of Halifax County, Mr. Branch, brought two Loyalists in for punishment - one took the oath of allegiance and was discharged. During this second session, the Provincial Council learned more about how the offshore Royal Governor Josiah Martin and the officers of the HMS Cruizer had connived to instigate the discontent in New Hanover County two months earlier. His floating residence was, however, guarded by a detachment of Patriots, and his Excellency, now restricted in his movements was unable to effect any material changes in public opinion without the help of spies and secret communications - which did continue. The Second Provincial Council recommended to the Committees of Wilmington and Brunswick and to the commanding officers in the area to cut off all manner of personal communications between the HMS Cruizer and the shore, and that all letters to or from "Governor Martin, or the ship of war," should be opened and their contents observed. During December of 1775, the North Carolina Continental Line regiments were sent to Virginia to help defeat Royal Governor Lord Dunsmore at the Great Bridge in Virginia, and to South Carolina to assist in the famous "Snow Campaign" against the upcountry Loyalists. On December 21st, the Provincial Council resolved to raise a second regiment of Minutemen in the Salisbury District. The following officers were commissioned: First Regiment - Griffith Rutherford, Colonel; John Phifer, Lt. Colonel; John Paisley, Major. Second Regiment - Thomas Polk, Colonel; Adam Alexander, Lt. Colonel; Charles MacLaine, Major.